Peace for Afghanistan or comfort for the US? Afghan security forces gather at the site of an attack, where three American service members and a U.S. contractor were killed, near the Bagram Air Base, Kabul, Afghanistan, April 9, 2019. Human life is sacred, it's the law of life and without abiding by it, our civilization is doomed to perish. Taking human life is the gravest of crimes known to humanity. Still, war and terror are an everyday reality in the modern world. People die on battlefields, from random shelling and bombings at home and attacks by terrorists in the streets of peaceful cities and towns, marketplaces, restaurants, concert halls and even churches and mosques. A recent terror attack in New Zealand, a peaceful and safe country, has revealed once again that hatred and animosity produce perpetrators of the worst crimes against humanity. Let's not forget that all over the world people lose lives to war and hostilities ravaged by third parties. In this sense, Afghanistan is one of the worst examples of places where, for 40 consecutive years, war has bred generations of children not knowing life without it and adults more used to automatic rifles than the steering wheel of a tractor. This is wrong and should be changed, and nothing but lasting peace is to allow for this change. But peace won't come as a gift from God, it is to be built with the efforts of a great variety of people in order for it to become solid and lasting and hopefully helping the Afghan people live a happy and prosperous life. The 40-year long Afghan war was started by a country that has been wiped off from the world map for almost 30 years now. That country was the USSR and the war it launched helped to bring about its own demise while revealing to the world the impotence of the Soviet regime. Eventually, having lost hope of bringing Soviet-style rule to Afghanistan, the regime withdrew its troops a decade later. The country was left devastated and in the hands of a national government poorly equipped to carry the burden of power without the support of the Soviet military. Left abandoned, President Mohammad Najibullah stepped down in 1992 to be succeeded by a U.N.-sponsored interim government that led to even worse chaos and civil war. Regardless of U.N. assurances and diplomatic protection promised, Najibullah was hanged by the Taliban on a lamp pole after their takeover of Kabul in 1996. That pole remains today right outside the presidential palace and across from the CIA headquarters and is a grave reminder of the promises unfulfilled. Today, when the peace effort sees another twist, President Ashraf Ghani has addressed international actors, saying, "We insist on measures because we are aware of the experience of Dr. Najibullah. We all know how he was deceived. The U.N. guaranteed him peace, but it ended with disaster." Modern Afghanistan is associated with endless hostilities and acts of terror. But before the war started in 1979, the country enjoyed stability and relative prosperity for 40 years under the rule King Mohammed Zahir Shah, the last king of Afghanistan. That time is referred to as Afghanistan's Golden Age. An achievement of Zahir Shah was allowing access to education for both men and women to result in a strong community of female politicians, physicians, engineers and academics. The role of women in the country is a matter of current discourse in Afghanistan and a red line for the Taliban. The international community says it has been relentlessly trying to build stability and peace in Afghanistan in order to bring it back into a period of progressive development and safeguard regional security. Various initiatives have contributed efforts to Afghan reconciliation in recent years. In June 2017, the Kabul Process regional initiative called on armed groups to cease violence and start peace talks with the government by saying, among other things, "We strongly support the Afghan Government's commitment to forging a practical plan for reconciliation" and recognizing as its prime goal the respect for equal rights of all Afghans, including women. Further on, in 2018, an extension of the Kabul Process, the Tashkent Peace Summit on Afghanistan called for a "guaranteed integration of the armed opposition into the political life of Afghanistan and the recognition of it as a legitimate political force" of society. This became a new and practical element added to the peace settlement scenario to have received further detailed elaboration by the U.S. and Russia. Today, both the U.S. and Russia recognize that an integration of the Taliban into Afghanistan's political system is the only way for conflict resolution. The U.S. stance toward Moscow has experienced a twist, while its reaction to Russia's policy in the region had been openly negative until now. This February in Moscow, when attending a conference on Afghanistan, U.S. Special Representative Zalmay Khalilzad made a surprising statement to welcome a "positive role of Russia contributing to reconciliation, peaceful resolution of conflict and the inter-Afghan dialogue." The Moscow conference came two weeks after the Taliban-U.S. meeting in Doha, Qatar where significant progress had been announced. At the Doha meeting, the sides claimed to have agreed, in principle, on the two most fundamental issues, that the Taliban would not allow terror groups such as al-Qaida to use Afghan soil for attacks, and that the U.S. would withdraw its troops from Afghanistan. The U.S. drive to leave Afghanistan fosters its effort to approximate positions with Russia, which generates the latter's positive reaction. When on a recent visit to Kabul, Zalmay Khalilzad called for intra-Afghan dialogue, the talks were meant to encompass prominent Afghans, government representatives and the opposition, as well as the Taliban. The current U.S. initiative is focused on building a consolidated team of Afghan negotiators representing the national government and its opposition. The U.S. says it has relentlessly tried to establish peace and stability in Afghanistan for 18 years. Upon taking office, President Trump announced the South Asia Strategy, a new policy for Afghanistan, promising, inter alia, stronger military assistance to the Afghan government, but he has never seemed committed to it. While repeatedly emphasizing a desire to end military involvement, last December he unexpectedly asked the military to prepare for the withdrawal of about half of the 14,000 U.S. troops stationed in Afghanistan. Since then the U.S. policy seems bent more than ever on making a deal with the Taliban. Still, no withdrawal is feasible until the Taliban and the Afghan government make a peace deal. In the meantime, Afghan officials have seen the sudden change in their ally's position as a betrayal and fear a separate U.S.-Taliban deal if the troops' withdrawal can't happen except through such means. 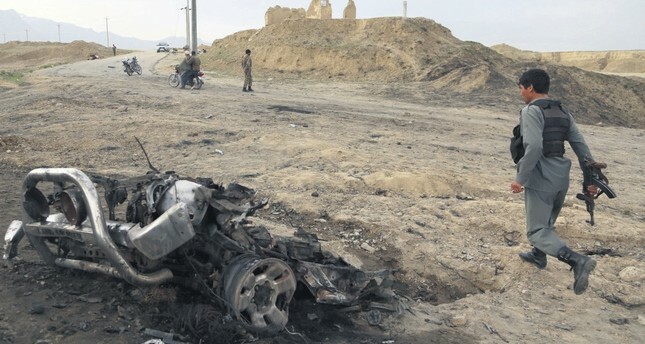 By siding with the Taliban, they believe, the U.S. is not only leaving an ally vulnerable but puts at risk the 18 years of painstaking progress that has come at the enormous cost of blood. The incumbent Afghan government is largely left marginalized by the current U.S. initiative. "The victims of the war are Afghans," stresses Afghan president Ashraf Ghani, "the initiative of peace should be in the hands of Afghans." His position reveals a concern that an abrupt U.S. exit could plunge the country into vicious fighting, the way it happened after the Soviet departure in 1989. This concern is grounded: The Taliban declared last month that the Afghan armed forces, built at enormous cost and more than 300,000 strong today, would have to be disbanded if a peace deal is reached. While falling out with the U.S., President Ghani continues alienating the Afghan political elite due to his attempts to combat patronage and corruption and to be a chief negotiator with the Taliban. The timing is wrong for his attempts – the Taliban are enjoying more and more success on the battlefield, while presidential elections are coming in July. "What we're getting is a deal that doesn't end in peace," believes Hamdullah Mohib, a national security adviser to the Afghan government who blames the U.S. for a lack of transparency on the talks and sidelining the Afghan government. Triggering more U.S. frustration, Mohib complained in public that the Trump administration had alienated the Afghan government, legitimized the Taliban network and has been crafting a deal that will never lead to peace. The ongoing U.S.-Taliban approximation results in a twisted reality. During the recent talks in Doha, Zalmay Khalilzad praised the Taliban's representative as a "patriot" while struggling to find common ground with the country government. The Taliban refuses negotiations with the government, calling it a "U.S. puppet regime," but have held informal talks in Moscow with Afghan politicians. The next round of talks in Doha will come in mid-April, and its participants include Taliban insurgents and Afghan government officials as private individuals.